Duff, you might be right! When I was 22, in 1967, I was involved in community theater and I played the Spencer Tracy part in our production of the original play that the movie was based on. I still remember being called, "the deficiency expert!" I just saw this film for the first time. 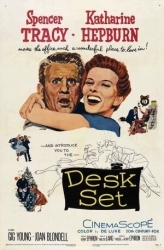 Katharine Hepburn plays the manager of a broadcast network research department. Her character, BUnny Watson, has an incredible memory and knows everything about everything. I can't help thinking that IBM's Jeopardy-playing supercomputer is named after her, not after Thomas J. Watson, IbM's first president. A bit of Googling tells me I'm not alone.